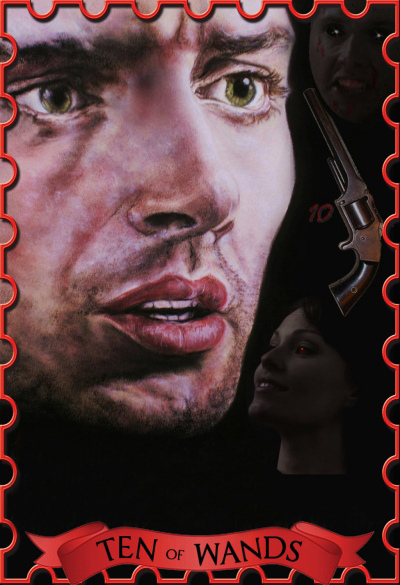 Artist’s notes: This is my first card for the Winchester Arcana. The card is about lost energy, control, power, leadership. But too much power implies a big burden, fatigue, exhaustion. There is a desperate need to to let it all go, delegate, rest, recover… To be strong again. Dean’s deal. Dean is going to hell. He ‘chose’ to do it and doesn’t want to talk about it. He has control over his life and death. Apparently. All his vibrating energy, “everything’s cool attitude”, “enjoying life before saying goodbye” is a pose. He is tired of fighting; it’s too much. He is terrified; he will become a demon. No escape. He wants to hide, crawl and disappear. Needs a break and doesn’t know what to do, how to speak about his feelings, his fears.